Drama ratings and reviews are often led more by the heart than the mind, a fact that I'm well-aware of, considering my many rants and raves here. While rants tend to be more satisfying, sometimes it's just magical to find a drama that makes you go do exactly the opposite - to post because it's SO GOOD rather than because it pissed you off. Prosecutor Princess is that drama for me. I understand intellectually that it's not the best production I've ever seen - the beginning was slow, the music at times overbearing, and the awful hair Hye-Ri sported in the first 4 episodes (before production got sensible and pulled it into a ponytail for the rest of the run). But it was a drama that captured my heart, in a way that no drama before or since has so completely. I got a hold of the DVD set last week, and figured it was time for a rewatch. With my newly raised drama standards and existent knowledge of the plot, I wanted to test if I'd still love it as much now as I did almost two years ago, or if new and intolerable flaws come to light. Having recently completed the marathon, I'm happy to say it still stands as my all-time favorite drama :) The acting just wows me in every scene, and the storyline so tightly written and beautifully presented that it never once skewed irredeemably towards the unbelievable or inconsistent. Certainly, some elements such as make-up and clothing could have been toned down (i.e. fat Hye Ri and early Hye Ri), but the plot, dialogue, and characters remained continually solid. I can understand why some people were turned off to our heroine, Ma Hye Ri, at the start. The first two episodes do a terrible job of introducing her, making her seem selfish, naive, and ridiculous in both mannerisms and appearance. It's only due to Kim So Yeon's sensible and grounded performance that I actually didn't mind Hye Ri then, who came across as more spoiled but good-natured than bratty. Hye Ri of course, ended up being one of the most endearing, realistic, intelligent heroines I've ever watched. I'm sad that the first couple of episodes don't do her justice, but I'll accept that in a way it was necessary to paint her poorly, because much of the joy of her character came from watching her transform and really grow as a person from the first to the last scene. What I loved here is that unlike other drama "character development," Hye Ri always remained Hye Ri. She continues her quirkiness and open-heartedness, believably maturing without losing her charm or personality. Probably one of the best-drawn lead girls in all of dramaland - if you haven't watched PP yet, just bear through the first few episodes and I guarantee that she'll grow on you. Filling out our central couple is the deeply conflicted and complex Seo In Woo. I never understood the shipping wars. I mean, clearly In Woo was our man from the very beginning - that "chance" hotel meeting? I still recall it as my first exposure to Park Shi-hoo, and what an absolute swoon moment it was. Admittedly, he was stalkerish for much of the drama, but it didn't come across as creepy so much as intriguing and oddly sweet (here's a guy with great timing for everything). It also added a new dimension to the plot - the writers never had to rely on "random" encounters in order to get our leads in close proximity. Instead, every meeting was pre-orchestrated by our guy, all for a believable and understandable secret cause that justifies and ties it all together at the end. Sounds weird, but was fascinating to watch, especially this second time around, when I already knew and understood In Woo's inner motivations. And a wonderfully unique premise in a land where "fate" and cliches abound onscreen. In Woo's actions, while a bit extreme, perfectly exemplify the idea of creating one's own destiny. If he hadn't gone through with his plan for justice, or if the source situation had never emerged, these two people would likely have remained strangers for the rest of their lives. Instead, they are forced to know and comprehend one another, and unwittingly fall in love along the way. Stiff yet oddly likeable coworker to Hye Ri. The guy who played him isn't really my type, even if I do appreciate his buffness. He did a pretty good job making a character who was flat for much of the first half secondly come alive in the second half. I'm also happy he bowed out of the race for our leading lady early on in the game, instead having some fun side romance scenes with second lady below. And he never (directly at least) causes angst for our couple, which I appreciate. By contrast, he sparked one of the best kiss scenes ever filmed, which greatly upped my liking of him. A quiet, sensible prosecutor. In a nice turn from the traditional set-up, she's a rival for the second lead male rather than our lead male, which was a brilliantly played dynamic. Not everyone on screen needs to be fixated on our main leads, and it's refreshing to see side characters with lives of their own. She also behaved totally rationally, in a way that I could actually see myself doing. I appreciate that. The actress did have a tendency to overact on the cute and shy, which got a bit annoying (especially that skirt-holding in the end - I found it very hard to believe she'd be that traumatized about wearing a past-the-knee length skirt to work). I liked her most when she played the voice of reason and helpful advice to Hye Ri. I think technically she's In Woo's sister via adoption. Mostly his partner in crime on this super secret case. She was probably the closest of the three here to a typical and catty second-lead. But she never really crossed into becoming one, because neither she nor In Woo ever harbored romantic feelings for one another. However, she does have terrible timing with interrupting key OTP moments and was rather bitchy until the sudden upturn at the end. I respect her character though, and can understand her motivations. Along the lines of likeable second leads are likeable parents. I know, in an Asian drama of all things! Hye Ri's mother and father are obviously the key players here - neither felt like a plot device out to thwart their child's love life - instead, they were lovable and pitiful and real in their own ways. Her mom is adorable! No wonder In Woo totally liked her, I would love having her as family as well. The weird thing is she starts off so pathetic and strange, yet her open-heartedness and childlike innocence was so sweet. Even her fearful interactions with her husband were hilarious and cute. Most of all, I liked that she remained a steadfast supporter of In Woo and Hye Ri being together, without trying to intervene as drama moms are prone to do. I haven't liked this actor in any of his many other roles, but here he just shines, most notably in the last couple of episodes. Honestly, MST is a big jerk for much of this drama, seemingly a typical overbearing parent and husband. However, his layers really start to peep through in the latter half, and I ended up empathizing for what he went through and why he did what he did. He's also awkwardly funny while being mean - it comes across as more bark than bite, since he yells a lot but eventually relents to the women in his family when they're assertive. The plot really revolves around him in many ways, and I was happy to see his character and the acting really rise to the challenge. I despised them in the beginning, and didn't have much overall like during my first viewing. But this time around, I actually became rather fond of them. The chief is hilarious and adorably sweet in a gruff way. Even the two tag-along prosecutors, who don't have much more than humorous one-liners to say throughout, kind of grew on me. Part of Hye Ri's transformation involved her dramatically improved relationship with her colleagues, alongside their gradual acceptance of her personality. This was pretty well-depicted despite the limited screentime. Going on to the plot, I loved how everything tied together from beginning to end, as if the writers went into this with a solid idea of where they were going. Unlike most hurriedly-written dramas that lose their path midway, PP strides forward with self-awareness and purpose. The pacing is perfect, especially in the later episodes. Where normal dramas sink into noble idiocy and unreasonable angst right before the big finish, this one clips forward perfectly in story and character progress. Nothing feels too drawn out or merely there as a filler, because even the seemingly insignificant storylines play a well-tied role in the overall story. For instance, that strange house co-dweller arc. At first glance, it seems he's nothing more than a throwaway device, used to get our leads together again. But on the second viewing, I found his presence necessary as well as amusing. Hye Ri needed something to 1) make her realize In Woo rather than Se Joon is her most trusted person and 2) Allow her to forgive In Woo's picture incident and accept him as a positive presence in her life. Adding to that, when the co-dweller's mother came over with her pile of hard-earned recycling money for bail, I realized the drama was also imparting the message that behind every person is a unique lifetime, filled with their own challenges and motivations. Similarly, every piece in PP feels carefully constructed and put in place, without any loose screws floating around. We have lines from the beginning episodes reappearing wittily and serving a renewed purpose later on. We also have character moments and descriptions that tie in directly with how the character learns and grows. I was never frustrated by any character's actions because it so fit everything we knew about them. It's marvelous to watch something so penned with intent. Parallel to that is how well-crafted each character interaction is, making Hye Ri's slow process to falling in love so tender and believable. While I adore how bold she was in proclaiming her feelings for Se Joon (here's a girl that doesn't sit around waiting! ), it was the subtle, unintentional yet inevitable growth of her feelings for In Woo that really wove into my heart. Even before Hye Ri, or even the viewer, consciously realizes that she likes In Woo, the drama leaves us lightly-placed hints, telling the story with nuanced actions rather than words. Such things included her smile when she sees In Woo enter her office during the Shin Dong Ha case and small, unconscious moves like the movement of his alarm clock from the far table to right by her bed. For In Woo, the gradual lingering gazes, the layered uncertainty in eyes at wondering if she'll go to Japan, even the eating from her ramyun bowl (so fitting for the scene!) just killed me. PSH nailed In Woo's pain and inner conflict, tied with his reluctant affection for Hye Ri. This, after all, was the drama that started my (and many other girls I'm sure) fancraze for PSH. 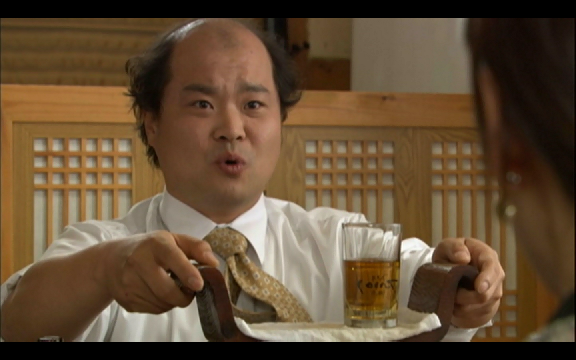 No one else could have brought such depth and likeability to a controversial character like In Woo. And yes, this was the drama that sparked my love for Korean ramyun. Who wouldn't want to eat a nice warm bowl after watching the episode 8 cooking scene? It made me sad that we didn't get so many cute OTP moments post-episode 9, because this was a pair that had some of the best dialogue and actions ever. Give me the direct, upfront store-trips and piggybacks, not the multitude of almost-touching-but-not scenes that crop up later. I can understand why the drama had to go serious, but I sure missed the good old happy Hye Ri - In Woo days. Production-wise, this drama nailed it. It was a bit shaky at the start, with unnecessary dressiness and loud, obnoxious music. But this was a crew that definitely improved - after the first few episodes, the music transformed from refrains of Fly High to soft ballads and moody instrumental pieces. To this day Goodbye My Princess is my favorite kdrama song. It plays quite a bit, but not to the point where I ever got tired of it. It was so perfectly fitting for the drama's story and presence- in fact, I suspect it's one of the reasons why PP underwent a title change to include "Princess." Also, the scenes were shot with such focus and clarity. People and items are positioned purposefully on the screen, never haphazardly. Even better, there's almost none of that "present one scene shot from three different angles" crap. Instead, the director sticks to one angle and only presents that to show any moment in time. He may move the camera around during the scene, such as when Hye-Ri and In Woo kiss the first time - they only show one angle of the actual moving-in-for-the-kiss, even though it's followed by different shots of the kiss itself. Similarly, the walking past one another scene in late episodes, the camera slows and the angle shifts from them to their hands, but the actual passing moment isn't repeated. I like that- it shows careful thought and decision-making by the PD on how to present the shot rather than just mangling a bunch of views together (as Taiwan dramas tend to do). I wish the ending had been longer - in fact, this is one show that I honestly feel could have benefitted rather than suffered from an extension. Not so much for the trial portion, since we all know where that was going, but for more OTP fluff. There was so much jammed into the eventful 16th episode that I felt our reunion wasn't fully fleshed out. And wow, that departure in the pale-blue morning scene just ripped my heart out. So beautiful, so tragic, it was like saying goodbye to the drama itself. I highly recommend that you watch this gem of a show if you haven't, and if you have, consider a rewatch on a rainy day, as there's much to analyze and appreciate.